With wood-cut style illustrations and a simple message, this black and white Baby Book is perfect for story times and bed times alike. Explore the God-given gift of animals with this beautiful first board book for baby. Stunning high-contrast black and white wood cut illustrations with spot foil colours make each page a delight. The burst of colour on every page and simple words to name each animal and its description are perfect for baby. A relevant Bible text is also included at the end of the book. God's Animals: Black And White Baby Book by Erin Balzer was published by Authentic in March 2018 and is our 1854th best seller. 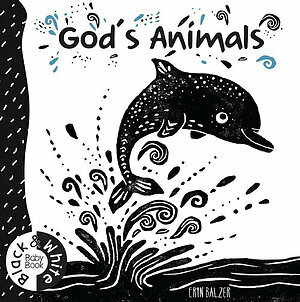 The ISBN for God's Animals: Black And White Baby Book is 9781860242526. Be the first to review God's Animals: Black And White Baby Book! Got a question? No problem! Just click here to ask us about God's Animals: Black And White Baby Book.